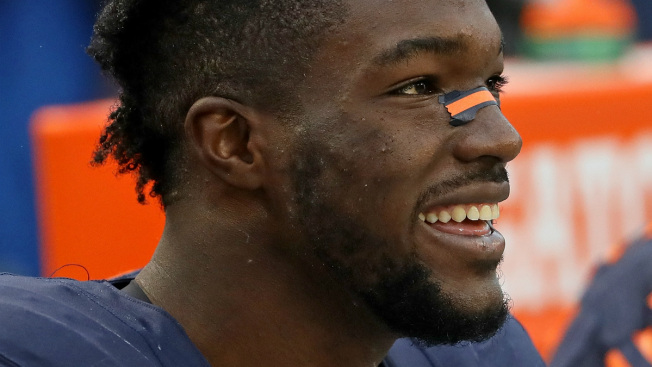 Leonard Floyd #94 of the Chicago Bears smiles while sitting on the bench late in a game against the Detroit Lions at Soldier Field on October 2, 2016 in Chicago, Illinois. The Chicago Bears released their final injury report on Friday ahead of their game this weekend against the Tampa Bay Buccaneers, and there’s a new name on the list that might be concerning to fans. Linebacker Leonard Floyd has been officially listed as questionable by the team with a back injury. This is the first time this week that Floyd has been listed on the injury report, and the timing is rough as the Bears are heading into a road game against a potentially playoff-caliber team. Offensive lineman Kyle Long was once again limited in practice with an ankle injury, and he too is questionable for the game. Running back Jordan Howard is questionable with a shoulder injury that landed him on the injury report this week, and wide receiver Markus Wheaton is questionable with a finger injury. Cornerback Prince Amukamara (ankle), linebacker Christian Jones (back), and wide receiver Joshua Bellamy (ankle) are all questionable for the Bears. One player is listed as doubtful, as Benny Cunningham likely won’t play after injuring his shoulder against the Atlanta Falcons in the Bears’ Week 1 loss at Soldier Field. The Bears will make at least some of the determinations on whether players will suit up or not on Saturday as the team travels to Florida for the game.